Cupar Flower Show was held in the Corn Exchange last Saturday, 22nd August, and saw a very colourful and attractive display for those attending. Despite there being only a few vases of cut flowers, the wonderful scents of the sweet peas welcomed all attending the 104th Show, coupled with the very colourful table of pot plant exhibits. Thomas Nelson from Cuparmuir was the winner of the East of Scotland Four Vase Sweet Pea Championship, and Alan Weepers of Leven taking the John Gerrie Medal for the most first prizes in pot plants, with the committee’s very own Lisa Hegg gaining recognition for the best Fuchsia exhibit. The floral art category saw an amazing increase in the number of exhibits in each class. This year’s judge had a tough job of selecting the winners as the quality of the exhibits being very high indeed. The best floral exhibit in show, sponsored by Gladys Lundie, Cupar, was awarded to Mr Andy Smith of Balmullo for his exhibit depicting the Queensferry Crossing. 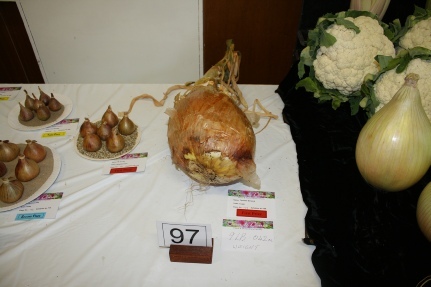 There was a fantastic display in the vegetable section, with the extraordinary specimens of the tallest leeks, carrots and parsnips being shown by Mr E Low of Strathkinness, who also gained the most prizes in the vegetable section and took the Watt Trophy for the most prizes in Show, but newcomer to the show, Thomas Berwick, brought the heaviest onion weighing in just under 10lb. The industrial section was supported well with a range of home baking, preserves and handicraft section. First time entrant, Mrs Mary Finlay championed in the baking section with Mrs Vera Drysdale taking home a number of trophies. This year, the Schools in the local area were able to get assistance from SRUC Elmwood Campus to help them create a flower garden, vegetable garden or a combination of both. Judged at the end of June before the school holidays, saw five entrants, from primary and secondary schools to nurseries taking part in ‘Growing for Fun – best garden allotment’. Westfield Family Nurture Centre came out on top with judge, Bruce Robertson from SRUC, commenting that “it has a good mixed garden setup with ideal community links. Produce being used by the children and families for cooking, and a wide range of garden elements.” It is hoped that this new initiative, supported strongly by SRUC Elmwood, will develop further in 2017, and if any other educational establishment wishes help or advice for their garden, they should get in touch with the Cupar Flower Show organisers. The Scottish Women’s Rural Inter Institute Competition based on a day at the allotment was won by Kilmany SWI. The Garden competitions, that form part of the Cupar Flower Show, were judged this year by Mr David Drummond from Freuchie. “The gardens we have been round are beautiful and a lot of time and effort have gone into maintaining them. It is not easy trying to keep on top of the weeds when it has been so wet and then so warm, its affect on the produce is evident as some produce is just taking a bit longer this year.” He continued, “the classes were very competitive but a pleasure to judge, and it is encouraging to see new competitors entering into these classes too”. A selection of those gardens are shown below. The generosity of the local businesses through sponsorship or the donation of prizes cannot be emphasised enough; it’s down to them that we are able to award the level of prizes we do and to put on such a fantastic show. There was also a fantastic backdrop on the stage from the Fife Bonsai Society, who were busy styling trees throughout the day. Vice President, Debbie Wheelans thanked all the competitors, committee members and visitors who made the show a success and said “It was nice to see some new exhibitors coming away with awards and it’s encouraging that our new categories for novice growers and Bonsai’s were supported; here’s hoping for more entrants again next year”. If you enjoy gardening; create hanging baskets in spring, have a nice patio ornament, maybe have a collection of border flowers, grow your own fruit or vegetables, are good at baking, needlework or floral art, please give consideration to entering next year’s Flower Show. We are also always looking for committee members and volunteers as numbers are always dwindling. Guess the weight of the cake, sponsored by Fisher & Donaldson was won by Gavin Jones of Cupar. Many thanks to all who donated prizes and raffles.